September 28, 2007 By John P.
This is definitely one of the strangest natural phenomenon I’ve ever read about. Well, that’s basically what happened off the coast of Yamba in New South Wales! Here we see kids frolicking and playing in the wonderful ocean foam, oblivious to the fact that it is comprised of dead plants, decomposed fish, and seaweed excretions! 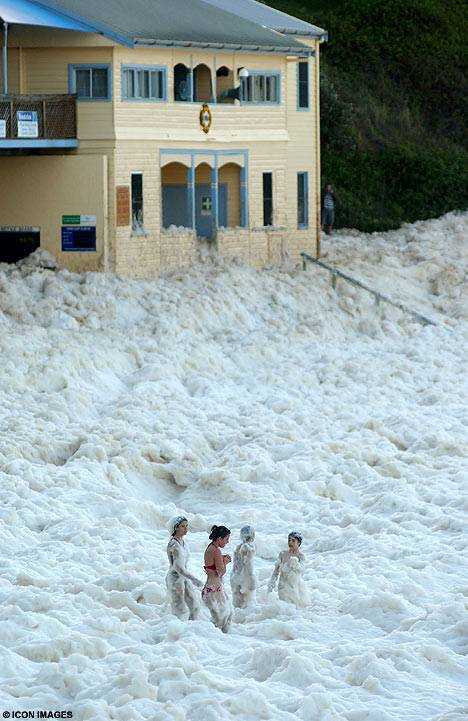 Foam swallowed an entire beach and half the nearby buildings, including the local lifeguards’ centre, in a freak display of nature at Yamba in New South Wales. One minute a group of teenage surfers were waiting to catch a wave, the next they were swallowed up in a giant bubble bath. The foam was so light that they could puff it out of their hands and watch it float away. It stretched for 30 miles out into the Pacific in a phenomenon not seen at the beach for more than three decades. Scientists explain that the foam is created by impurities in the ocean, such as salts, chemicals, dead plants, decomposed fish and excretions from seaweed. All are churned up together by powerful currents which cause the water to form bubbles. These bubbles stick to each other as they are carried below the surface by the current towards the shore. As a wave starts to form on the surface, the motion of the water causes the bubbles to swirl upwards and, massed together, they become foam. The foam “surfs” towards shore until the wave “crashes”, tossing the foam into the air. In this case, storms off the New South Wales Coast and further north off Queensland had created a huge disturbance in the ocean, hitting a stretch of water where there was a particularly high amount of the substances which form into bubbles. 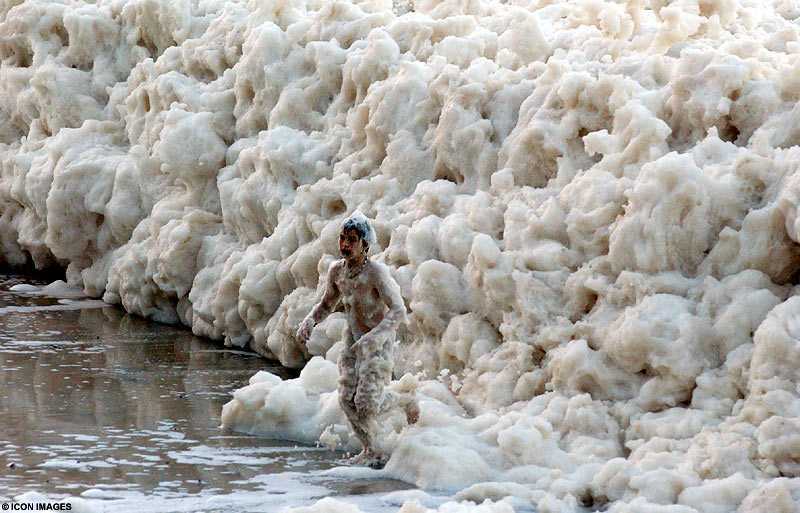 The foam is so light and fluffy that it actually blows into town and even fills up the streets! You are welcome to copy it if you wish. Now knowing what the foam is composed of, I’m so disgusted! Hope those kids didn’t swallow any of that stuff! Yamba isn’t close to Sydney in anyone’s reckoning. It’s at least 700km (550 miles) north of it. I wouldn’t want to walk to it from Sydney. This event happened in August some time and made the news around here. (I live about 90 minutes away from Yamba). That is weird and amazing and I highly doubt that I could resist the temptation to play in it! A video would be great to see, for sure! I’ll try to remember to look for one. That sounds a little bit disgusting! I would feel (similar to Johny) that it would be rather unsafe. But on the other, it would still be highly likely that I would venture in if it seemed to me to be even remotely possible (AKA I would not positively get a disease from going in). That would DEFINITELY be a once in a lifetime opportunity! I wonder what it smells like, “salts, chemicals, dead plants, decomposed fish and excretions from seaweed”… As daring as I am, this is one poisonous mess I would stay away from!